How does a Pizza Shoppe fit into my business? What does a partnership with TBHC Delivers and Hunt Brothers® Pizza look like? We’ll take a quick overview of how the program works once it’s up and running, and answer some common questions along the way. The Pizza Shoppe is a part of your existing store. 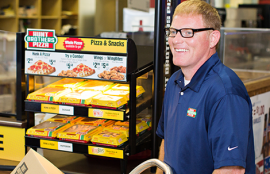 A Hunt Brothers Pizza Shoppe operates within a c-store environment, from a specialty kiosk installed and serviced by TBHC Delivers. We’ll help you choose the best re-arrangement and setup to maximize sales in your specific store. Your existing staff becomes your Pizza Shoppe staff. Our highly efficient process, prepared product and simple pricing make it easy for your current staff to prep, serve and ring up pizzas alongside their regular duties. Most c-store owners do not need to add staff or increase hours to service their pizza business. 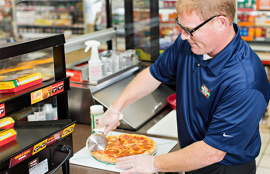 A Hunt Brothers Pizza Shoppe operates within a c-store environment, from a specialty kiosk installed and serviced by TBHC Delivers. Pizza is a same-register sale. Your profits are yours alone, and pizza sales are as much a part of your everyday inside sales traffic as snacks and beverages. We never require an additional sales register or special reporting. We simply help grow your product offering and profits. Your Pizza Shoppe stays open when you are. Hunt Brothers Pizza Shoppes sell product all day, every day. From breakfast pizza to traditional pies and specialty items like wings and limited time products, your shoppe — and your sales opportunities — never need to close. Hunt Brothers Pizza sets pricing and products for hassle-free sales. Hunt Brothers Pizza provides a high-value pricing structure that’s ready to go. Not only does your customer get an incredible value, your inventory and checkout processes stay streamlined and easy. TBHC Delivers inventories and re-stocks your Pizza Shoppe weekly. Our expert Account Managers visit each week to take inventory, re-stock product, and offer training and marketing support on-site. You only pay for the pizza. Outside of your initial investment with TBHC Delivers and Hunt Brothers Pizza, your only regular operating cost is re-stocking your product. No additional staff to pay, no marketing costs and no franchise fees. Ever.